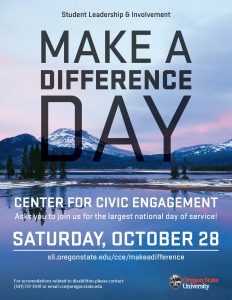 Join Student Leadership & Involvement and the Center for Civic Engagement for this year’s Make a Difference Day 2017, happening on Saturday, October 28! 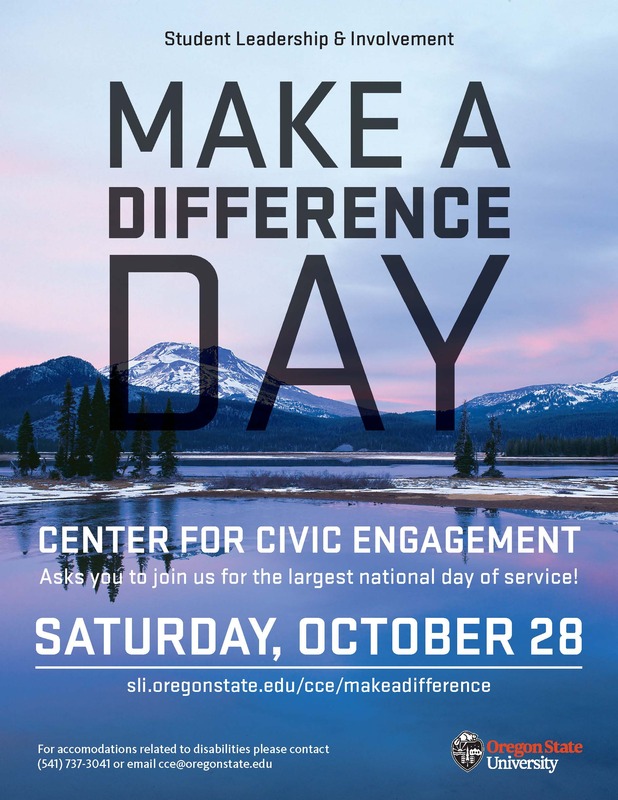 Make a Difference Day is a nationally recognized day of service where thousands of people across the country work to improve their community. Join us to learn about and contribute to organizations that are doing great work to strengthen our local community while building connections with others at OSU. Bond, learn, serve! This year you can be part of this amazing experience by signing up for one of our 5 projects, ranging from early morning to mid-day opportunities. Projects are open to OSU students, faculty, staff and their partners/dependents. Project descriptions include any age requirements. Click here to register for the 2017 Make a Difference Day! Participants will need to login using their ONIDs. We will be hosting 5 different projects with start times in the morning and going to mid-day or mid-afternoon. We are partnering with Corvallis Housing First for home/shelter beautification, Wildcat Ridge Sanctuary for tree and flower planting, Student Sustainability Initiative, Growing Food Security, HSRC, and Organic Growers Club for Let’s Squash Food Insecurity – Pumpkin and Squash Processing Party, Greenbelt Land Trust for stream stewardship, and Meals on Wheels for crafting placemats and meal bags. Details about the projects can be found below and on our website here. The Facebook event can be found here. Accommodations related to disability may be made by calling 541-737-3041 or emailing cce@oregonstate.edu. Corvallis Housing First New House Beautification: Corvallis Housing First has a very simple mission: everyone should have a roof over their head. Through community support and involvement they’re working towards this mission on the city level. There first big step is the purchase a property on Van Buren. Project is from 9 AM-12 PM and will include: dining room cleaning and painting: We will be wiping down walls and baseboards and painting walls in the dining room at Van Buren House, a former sorority house near campus that will soon be a “housing first” facility, providing housing to people who have formerly been homeless. 10 volunteers needed. Check in will be at 8:30 am at the SEC Plaza. All ages can participate as long as all minors have a guardian present. Craft N’ Care with Meals on Wheels: Craft N’ Care is a service opportunity that is accessible for all ages and abilities. Volunteers will be making arts and crafts that will be donated to a local non-profit. Project is from 10:00 AM-12-30 PM and will include: making placemats and decorating paper bags for the senior meals program. 20-50 volunteers needed. Check in will be at 9:30 am at the SEC Plaza. All ages can participate as long as a guardian is present for minors. Wildcat Ridge Sanctuary Tree Planting: Wildcat Ridge Sanctuary believes in empowering Youth to Experience Environmental Stewardship as a Key Component of Leadership Development. Project is from 9 AM- 3 PM and will include: spreading various conifer seeds, scattering wild flower seeds, and planting Oregon White Oak acorns. 30-75 volunteers are needed. Check in will be at 7:00 am at the SEC Plaza. Youth 12 years of age and older can participate with a guardian. Let’s Squash Food Insecurity – Pumpkin and Squash Processing Party with the Student Sustainability Initiative, Growing Food Security, HSRC, and Organic Growers Club: All of these organizations share a common goal of fighting food insecurity with a holistic mindset. Project is from 9:30 AM- 1PM and will include: processing (peeling, cutting, roasting, mashing, and packaging) approximately 500 pounds of squash donated by the organic growers club. 12 volunteers are needed. Check in will be at 9:00 am at the SEC Plaza. Youth of all ages can participate with a guardian. Greenbelt Land Trust Stream Stewardship: Greenbelt Land Trust works strategically to secure significant natural areas in accordance with a careful plan. And they strive for connectivity, linking protected natural areas with parks and public spaces to provide wildlife corridors, protect valuable natural resources, and expand opportunities for low-impact recreation and renewal. Project is from 10:00 AM- 2:00 PM and will include: removing weeds from next to growing native plants alongside trails to improve habitat for wildlife and beautify a beloved natural area. 10 volunteers are needed. Check in will be at 9:10 am at the SEC Plaza. Youth 15 years of age and older can participate with a guardian present.